1. Which hibernate version you're using? Paul, already asked it? Which version of Hibernate are you using? There are incompatible Jar files on the classpath. why are you using both Hibernate4 and 2? Why you can't just use Hibernate4? 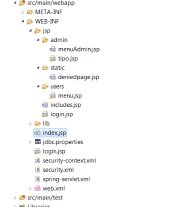 Ok.. you mean to say, hibernate-jpa jar file, fine, that is version 2 only..
Can you post the list of all Jar files you are loading? If you are using Hibernate4, you should be using the Spring classes for Hibernate4. Chane your AnnotationSessionFactoryBean to org.springframework.orm.hibernate4.LocalSessionFactoryBean. Now that Hibernate error is gone..
Can you tell us what you did after you got the previous exception? Did you add any extra Spring security Jars? Prasad Krishnegowda wrote: Can you tell us what you did after you got the previous exception? Did you add any extra Spring security Jars? i didn't add extra jars .. i just replaced the version of jars like previously i was using spring 3.0 and i read somewhere that for hibernate 4.0 compatibility i need atleast version above 3.1 so i just do that. Post the list of jar files you are packaging now..
Glad to know its working now..